After two years away the Grand Prix circus arrived at Spa to find that the track had been altered in various places and was now a little faster than previously. The Ferrari Dino 246s were rather more competitive than previously and Mike Hawthorn was fastest in practice with Luigi Musso second and Peter Collins fourth. The team also ran an older 156 with a 246 engine for Belgium's Olivier Gendebien. The car was painted up in Belgian racing yellow and Gendebien qualified eighth. Vanwall was the chief competition and Stirling Moss was third on the grid with Tony Brooks fourth but Stuart Lewis-Evans had problems and was down in 13th. Jack Brabham put his Cooper sixth and his team mate Roy Salvadori was 11th while BRM's Harry Schell and Jean Behra were seventh and ninth. 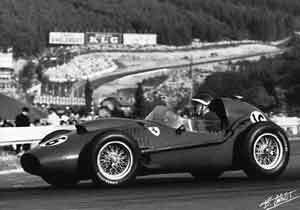 Lotus once again ran two cars and the rest of the field consisted of Maserati 250Fs, three of which were entered by Scuderia Centro Sud. After being held on the grid for a long time the field set off with Moss leading up the hill after Eau Rouge. Later in the lap Moss missed a gear and blew up his engine, leaving Brooks in the lead although he was soon being challenged by Collins. His engine had suffered on the grid, however, and he was out after five laps. On the next lap Musso suffered a tire failure and crashed. It was not a very interesting race after that with Brooks winning from Hawthorn, Lewis-Evans and Lotus driver Cliff Allison. The event marked the first occasion on which a woman had started a World Championship event with Marie Theresa de Fillipis in a privately-entered Maserati 250F. The 37-year-old Roman lady qualified over half a minute behind Hawthorn and finished in 10th position, two laps behind.